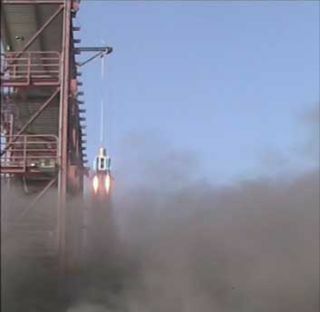 SpaceDev, Inc. concludes the first phase of development on its hybrid rocket powered lunar lander prototype, with a successful flight test. Aprivately-built moon lander prototype lifted off on a test flight Thursdayduring a successful check of its propulsion system. The Poway, Calif.-based firm, SpaceDev, launched the lunarlander prototype approximately 35 feet (10.7 meters) into the air on atether, where it hovered before descending for a careful landing. The testrepresents the first ever for a hybrid rocket powered lander vehicle. SpaceDev isworking with the International Lunar Observatory Association (ILOA) toultimately land a spacecraft on the south pole of the Moon for astrophysics andcommunication research. "This is anexciting project that has shown not only the versatility of our hybrid motors,but also SpaceDev's high levels of responsiveness and efficiency," said Mark Sirangelo,SpaceDev?s chairman and CEO, in a statement. "We see many importantapplications for our throttleable rockets, and we look forward to continuingour relationship with ILOA as well as our research and development of landervehicles." The landerprototype has four hybrid rocket motors that contain both solid and liquid fuel— a combination of non-explosive materials that supposedly reduces the chancefor accidents. The liquid fuel also permits throttling by controlling fuel flowand acceleration. SpaceDevpreviously worked with Mojave, Calif.'s ScaledComposites to produce the reusablehybrid rocket motor that launched SpaceShipOne, the privately-developed,piloted spacecraft that won the $10 million Ansari X Prize in 2004.